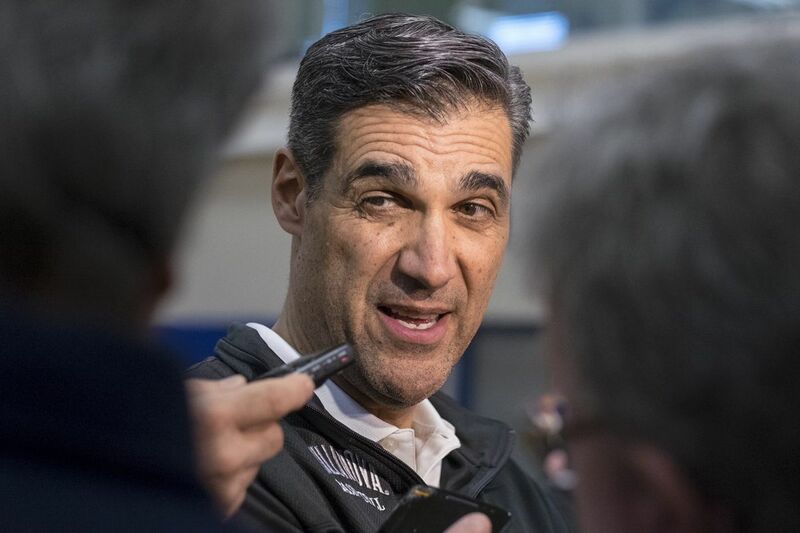 Monday March 20, 2017 Villanova’s Jay Wright talks to members of the press about his team, the season and the loss to Wisconsin in the second round of the NCAA tourney at an afternoon press conference at the Davis Center. Like his fellow Eagles fans, Jay Wright can't wait to tune into the Super Bowl on Sunday evening and watch his team try to bring home the NFL championship for the first time since 1960 — the year before he was born. But first, Wright will need to take care of some business earlier in the day – leading his top-ranked Villanova Wildcats into a Big East matchup against dangerous Seton Hall at the Wells Fargo Center. For that reason, he hasn't watched or listened to anything remotely related to the Eagles since the Wildcats (21-1, 8-1 Big East) defeated Creighton, 98-78, Thursday night. "I'm going out of my way not to look at Eagles stuff, not to enjoy it, because it's really interesting to me, and I'm forcing myself to focus on this," Wright, a season-ticket holder who has cheered on the Eagles since growing up in Bucks County, said Saturday after practice. "I owe it to Villanova and I owe it to these guys because a lot of these guys are not Eagles fans, and a lot of Villanova people that are not from around here are not Eagles fans. We had a Villanova alum in South Jersey offer to pay for green Nike uniforms for us to wear and I had to explain to him, 'I've got guys on the team that are Patriots fans. I've got Villanova alums from all over the country that would not appreciate that.' "
Wright has enough on his mind worrying about Seton Hall (17-5, 6-3), a Big East title contender that has three senior starters who will be going up against Villanova for the ninth time in their careers and want to leave town with their third win over their rival. The Wildcats' ability to shoot and score has contributed greatly to their success but it also has overshadowed a problem area – rebounding – that could be exposed by the physical Pirates, who have the nation's No. 2 rebounder in senior center Angel Delgado, averaging 12.1 per game. In nine conference games, Villanova has won the battle of the boards just four times and carries a rebound-margin average of minus-3.1. In the five games in which the Cats have been outrebounded, the combined damage is a whopping minus-52. "It's not something you can change with one day of practice," Wright said. "It's got to be a habit. It's got to be a mindset, and we just haven't had it. We're working every day to try to develop it. At practice, we emphasize it. We've got guys doing sit-ups when they don't rebound. We just have to develop a better mentality as a team." The 6-foot-10, 245-pound Delgado passed Syracuse's Derrick Coleman last Sunday to become the all-time leading rebounder in Big East games. He has accounted for 16 double-doubles in the Pirates' 22 contests this season. Delgado will be a handful for Villanova's big men – 6-foot-9, 255-pound redshirt junior Eric Paschall and 6-9, 245-pound redshirt freshman Omari Spellman – with 6-9, 220-pound freshman Dhamir Cosby-Roundtree coming off the bench. "You've just got to keep working," Paschall said. "You've got to definitely battle him. He's very strong down low. Sometimes he doesn't even leave his feet to grab a rebound. He's just so good at clearing space and being able to grab rebounds." The game looks like more than simply an appetizer to the main event later in Minneapolis. Once his contest is over, however, Wright will head home and be in front of his television soon after. "I can let myself go," he said. "I'll be all-in."